The Siemens Somatom Sensations, with its combination of performance and affordability, is an excellent choice for a number of applications. 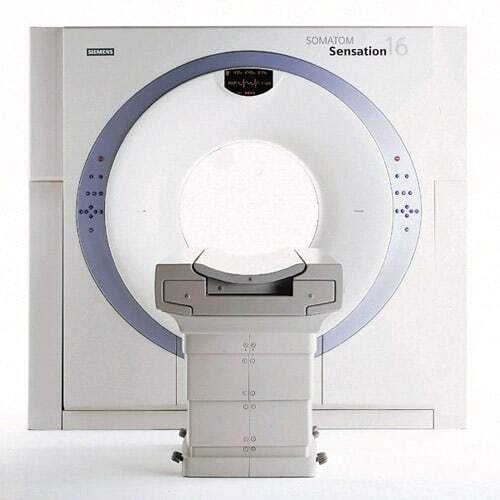 With its remarkable z-Sharp technology, the Siemens Somatom Sensation 16 CT scanner can produce images with clarity and detail that was once unimaginable. Plus, it’s Straton X-Ray tube is designed to last significantly longer than other tubes, which will save you money in the long run. With the increased efficiency of the Siemens Somatom Sensation 16 CT scanner, this system can literally help pay for itself. With the Siemens “Zero Delay” CT workflow tools, you can see more patients with greater efficiency and better imaging.